Simplify your wardrobe (and life!) with a 10×10 wardrobe challenge! I’m really looking forward to taking part in my first 10×10 wardrobe challenge! 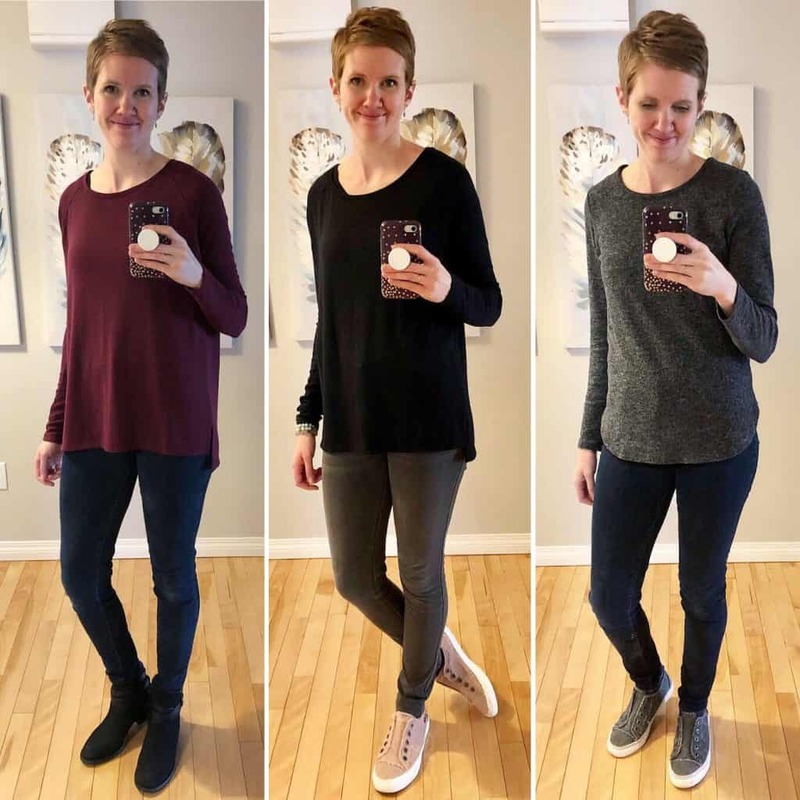 In today’s post, I’m sharing all about what a 10×10 wardrobe challenge is, how it works, why it’s a great experiment, along with my personal approach and what I’m learning! What is a 10×10 wardrobe challenge? 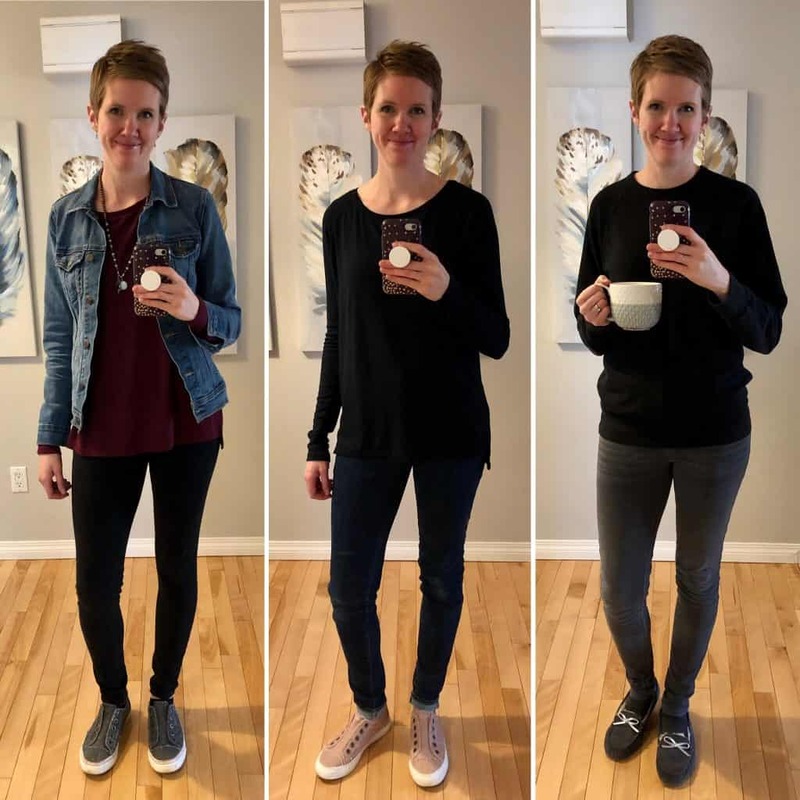 The concept for the 10×10 wardrobe challenge was created by Lee Vosburgh of Style Bee in 2015. She came up with the idea to help her love her current wardrobe more, and get more creative with her clothes while she was doing a month-long shopping ban. The idea of the 10×10 wardrobe challenge is to pick 10 items of clothing from your wardrobe and wear just those 10 items for 10 days, coming up with a new outfit combination each day. The idea quickly gained popularity. Not only is it a great way to experiment with dressing with less. But it’s also a fun way to challenge yourself to make better use of your clothes, get creative with your wardrobe and connect with a whole community of people dressing with less too! How does a 10×10 wardrobe challenge work? 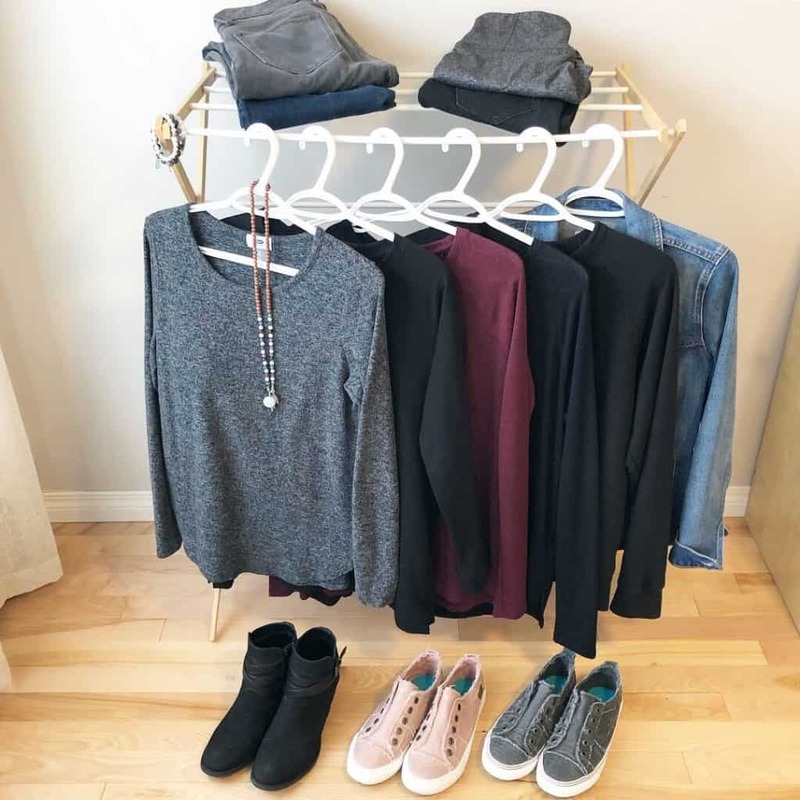 Essentially, you are creating a mini 10-item capsule wardrobe for your 10×10 wardrobe challenge. You can start your own 10×10 wardrobe challenge at any time. But the great thing about a challenge like this is connecting with other people doing the challenge too. There are popular hashtags you can follow on Instagram to connect with other people doing the challenge, like #10x10friends and #10x10challenge. Or you can get more specific by following seasonal 10×10 wardrobe challenge hashtags like #spring10x10, #fall10x10, etc. What are the “rules” for a 10×10 wardrobe challenge? As you know, I’m a big proponent of making and following your own rules when you are simplifying, especially when you’re simplifying your wardrobe. Lee offers some great guidelines in her post about the challenge, but the key is to remember to be flexible and have fun! She even offers a great 10×10 wardrobe challenge planning worksheet here that is an excellent resource. I love how she gives you a spot to rate each outfit on the worksheet so you can clarify what you love and don’t love about the outfits you come up with! A 10×10 wardrobe challenge is not about creating the perfect wardrobe or following a set of hard and fast rules. Instead, it’s about experimenting with dressing with fewer clothes, challenging yourself to get creative with the clothes you have and trying something new! What do you include in your 10 items? Lee suggests including 10 items from your core closet, including tops, sweaters, pants, dresses, shoes & outerwear. Her 10×10 wardrobe challenge guidelines don’t include accessories like hats, scarves, jewellery, bags, etc. in your 10 items. Use your accessories to add to your outfits and have fun. But remember, a 10×10 wardrobe challenge is meant to be fun! Don’t get hung up on the rules. The point of the challenge is to try out dressing with fewer clothes – however that looks for you! For example, in the 10×10 wardrobe challenge I am doing, I decided to only include tops and bottoms, not shoes, outerwear or accessories in my ten items. For no reason other than that’s what I decided to do! Why try a 10×10 wardrobe challenge? As I mentioned, I am taking part in my first 10×10 wardrobe challenge from April 1st until April 10th. 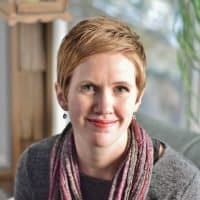 I was invited by Kimberley of The Case for Simple and was really excited to join. Despite using capsule wardrobes for quite some time, I have never tried a 10×10 wardrobe challenge. Seeing as this is my first 10×10 wardrobe challenge, and I’m learning how to do it right along with you, I thought I’d share my approach if you’re interested in trying your own 10×10 wardrobe challenge! First, I checked the weather forecast to see what kinds of clothes I’d need for the challenge. Spring in central Alberta can mean anything from snow to quite warm days, so I needed to know what kind of weather to expect. If the weather changes drastically during your 10×10 wardrobe challenge and you need to make some adjustments to your wardrobe, that’s totally fine. As with anything, focus on what you’re learning about yourself and your relationship with your wardrobe – not about getting it perfect! After checking the weather, I checked my schedule to know what activities I would need to dress for during the 10 day period. After checking the weather and my calendar, I started thinking about what I hoped to achieve during the challenge. Was I hoping to get more creative with the ways I use my existing clothes? Was I hoping to learn more about my personal style preferences? Etc. 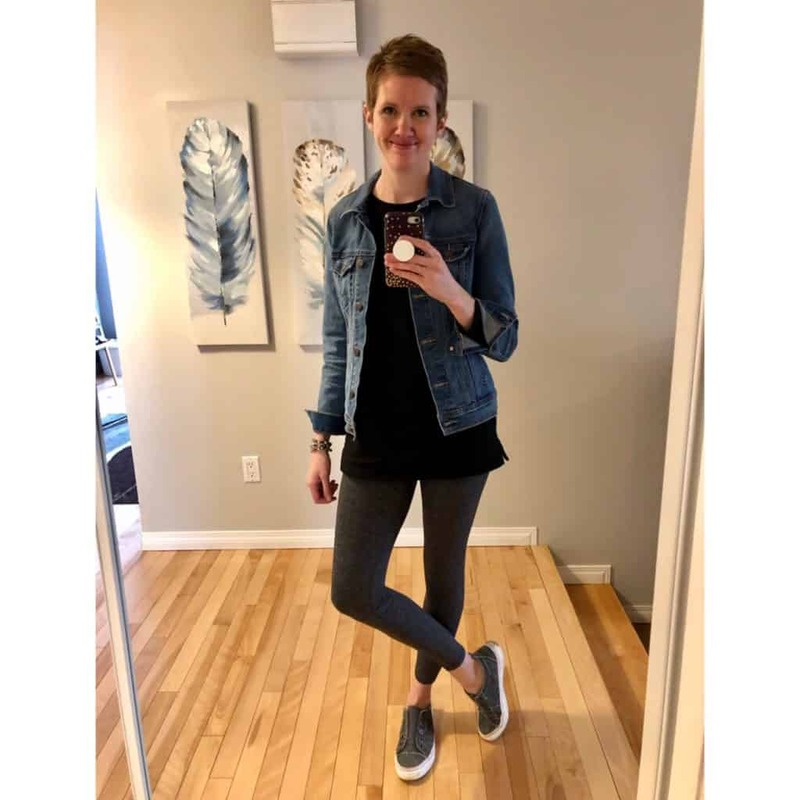 I decided my goals were to take my love of capsule wardrobes a step further and see how it feels to dress with a really small wardrobe for a set period of time. And I also wanted to try being slightly more creative with my wardrobe. I am a major outfit repeater. It’s not usual for me to wear the exact same outfit twice in the same week! I don’t particularly love making new outfit combinations. Instead, I usually wear the outfits I know and love over and over. 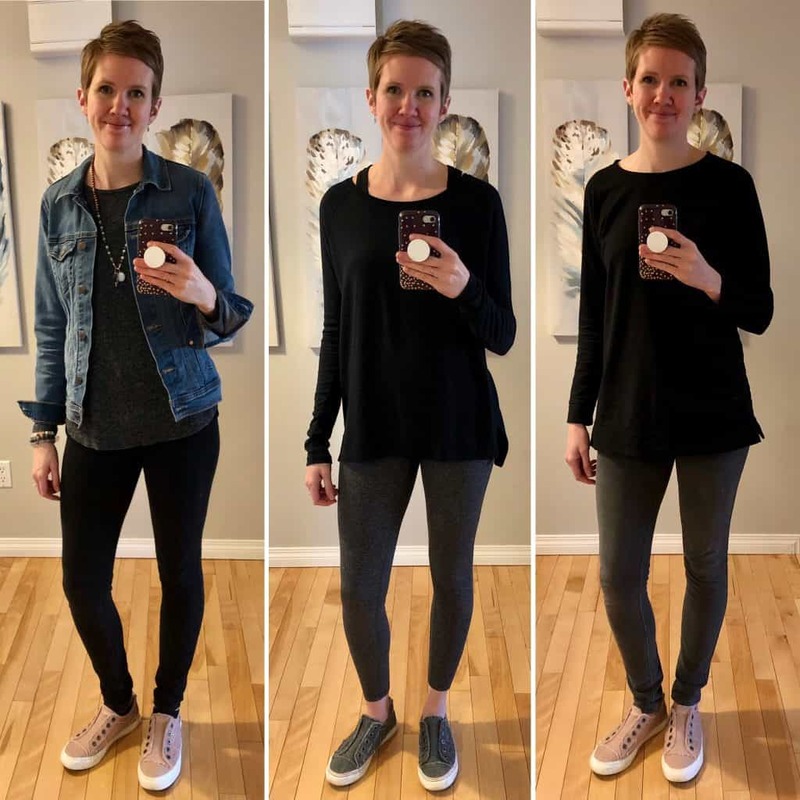 This has worked well for me, but I thought it would be fun to challenge myself a little bit by not wearing the same outfit more than once for 10 days. 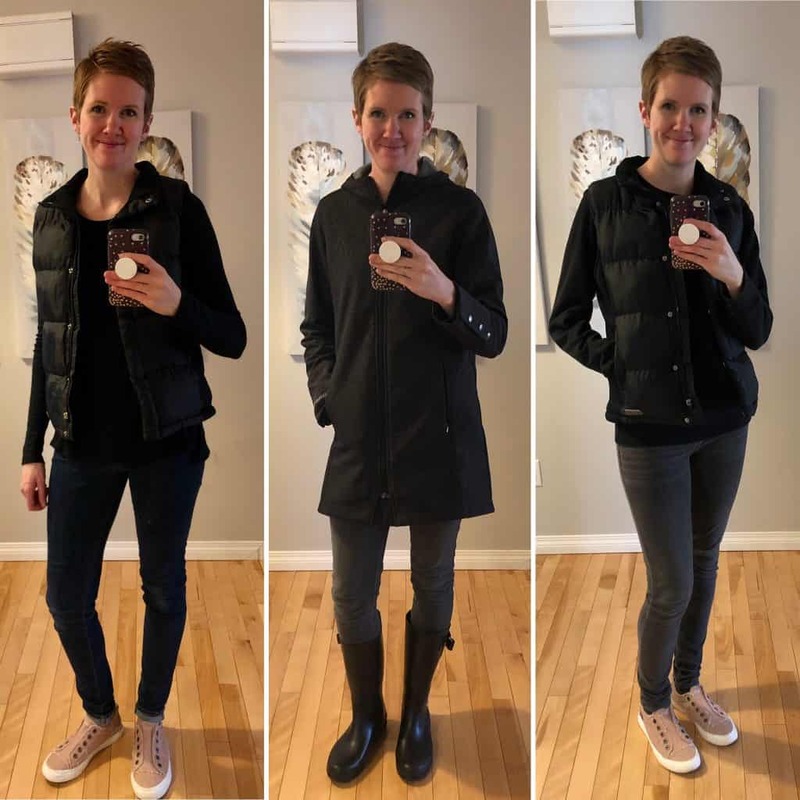 When I first agreed to join the 10×10 wardrobe challenge, I found myself tempted to put together trendier or more interesting outfits just for the sake of the challenge. I felt slightly insecure that my wardrobe and outfits would be too boring to share publicly. But then I stopped myself. I wanted this challenge (just like I want my capsule wardrobes) to reflect my real life and my honest style and preferences. So I have included my favourite items that I love and wear frequently as my 10 items. When I started planning my wardrobe for the challenge, first I decided what types of items to include and not include. As I said, for this challenge, I am including tops and bottoms, but not shoes, outerwear or accessories. I included a few pairs of shoes and accessories in the picture above simply to show some examples for interest sake. Next, I decide how many tops and bottoms I would include. In the end, I decided on 4 bottoms, 5 tops and one layering piece. From there, I unleashed my inner planning nerd and wrote down the 6 tops and 4 bottoms. Then I made sure each top would pair well with most of the bottoms I chose. You can see this in the picture below where I drew lines from each top to the bottoms it would pair with. Finally, I made a list of 10 potential outfit combinations I would be happy to wear during the challenge. To my surprise, I could easily make 10 different outfits with the items I was using. That in itself was a great reminder that fewer clothes don’t necessarily mean limited options. 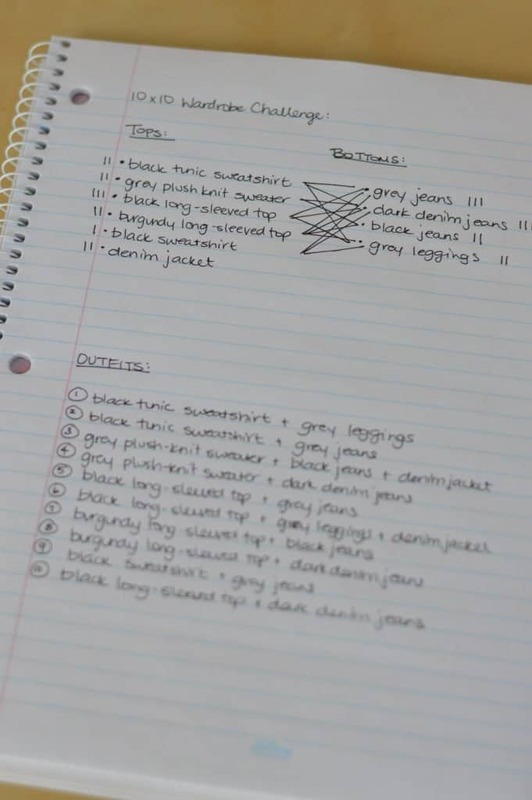 After listing the 10 potential outfits, I tallied up the number of times I would wear each item for those outfits. My goal was to make sure each item in my 10 item wardrobe would be worn at least 2 times during the challenge, just to make sure I was making good use of each item. Although the 10×10 wardrobe challenge is about dressing with and appreciating what you already have, if you are looking for similar items to the ones I’ve chosen, I’ve linked to them below if they are still available. The links are affiliate links, read my full disclosure policy here. I’ve had many of my items for quite a while, so if they are no longer available, I’ve linked to similar items. I’ll be sharing my daily outfits during the challenge on Instagram in my stories and on my page. The stories will all be saved to a highlight on my profile page too, so you can check back later. First, this challenge helped remind me that a small selection of clothes still gives you plenty of outfit options. I thought it would be hard to come up with 10 unique outfits with only 10 items of clothing. But to my surprise, it was easy to think of 10 different outfits. And in fact, I could have come up with more very easily! A small, but versatile wardrobe, can work very hard for you! This 10×10 wardrobe challenge also helped me clarify more about my personal style. When you have a small selection of clothes, there’s no room for anything you don’t love. 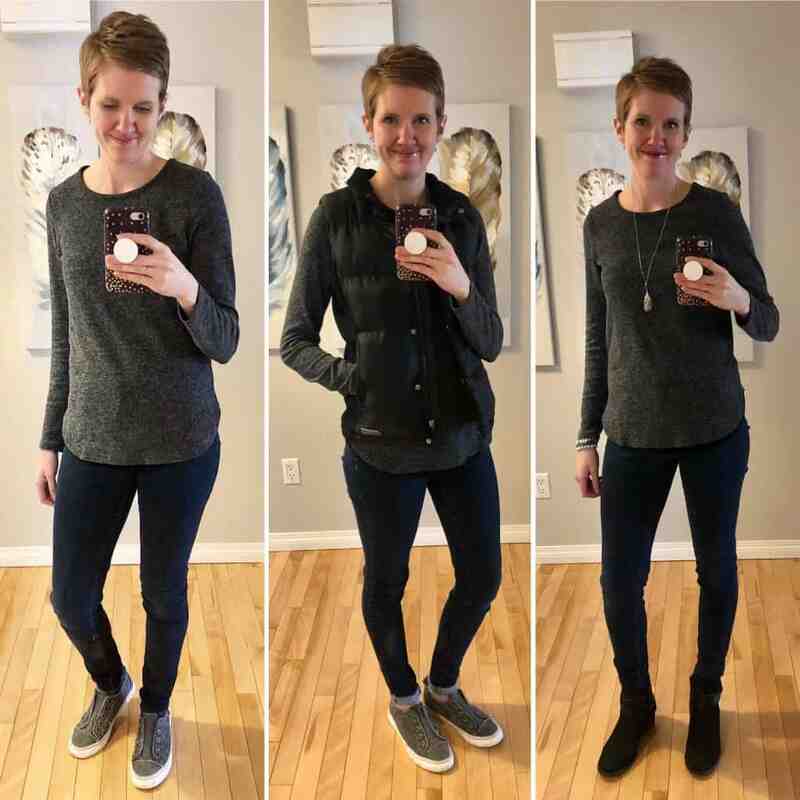 Seeing my choices reinforced that I love simple, basic, versatile clothes in mostly black and grey (not a surprise if you saw my most recent capsule wardrobe!). I’ve said before that a smaller wardrobe makes getting dressed and life in general easier. And this 10×10 wardrobe challenge is really reinforcing that for me. When you only have clothes you love and feel your best in, you’re happy wearing any of the clothes in your wardrobe. When all of your clothes are your favourites, it makes getting dressed really easy! One of the keys to simplifying and being content with a simplified life (including a simplified wardrobe) is learning to appreciate what you already have. It’s easy to get caught up in a cycle of wanting newer, better, trendier, etc., but when you make the intentional choice to use and appreciate what you already have your whole perspective shifts. The 10×10 wardrobe challenge helps you appreciate what you have and realize what you have is enough. You don’t need more clothes to have a better wardrobe. Sometimes you just need to be reminded of how great the items you already have are. And with a little creativity, you can use the items you already have in your wardrobe in new ways to refresh your wardrobe without buying or adding anything new! What do you think dressing with less would teach you? Have you ever tried a 10×10 wardrobe challenge? Why not try one! This is so true. In September, I pulled only my favorite eight complete outfits to put in my drawers and I packed the rest in the garage. I rotate and mix those outfits, and have been fine. Really, more than fine. I have not only found that my mornings are more peaceful, but when I close my drawers without having to use my stuff-and-close move, I can hear birds singing. As for the tubs of clothes in my garage, I am attempting to go two years without buying any clothes. If something gets torn or stained beyond repair, I can go “shopping” in my garage. Wow! This is amazing, Christine! What an amazing account of the power of less and the power of simplifying our lives. I absolutely love this, thank you so much for sharing. I love your challenge to not buy new clothes too, that’s amazing! And so smart to put your extra clothes away so you can go shopping when things need replacement or a little refresh! I love it! Thanks for reading and thanks again for sharing your experience, it is truly inspiring!